On February 1st, 2018, everyone was bullish on Bitcoin, more so the channels calling to hold (or hodl) on to Bitcoin, we all know what happened next. However, a Telegram channel going by @blockchainwhispersbaby announced to followers that Bitcoin was going to drop at the height of January. For anyone who has always been wary of self-proclaimed Telegram channels and Twitter prophets, the 96% accuracy of this channel has to be astonishing. That’s incredible, well above 75% which would be great. Blockchain Whispers called on everyone to sell Bitcoin and hold on to USD/USDT. Many expected this to be an epic failure on the part of its followers. To be fair, the call seemed ridiculous for Bitcoin which traded at $15,000+ at the time. So when Blockchain Whispers predicted a 25% loss in value, few heeded to these calls. Even despite the accuracy in previous predictions, many called this particular one insane. A day later, with Bitcoin shedding 25% in value, many were convinced the channels administrator actually knows what he is doing. Unorthodox but a wickedly-effective crypto trader. The person behind the channel goes by the name of “D Man”, and the way he acts bears no resemblance to the all too familiar Wall Street type figures. Going by various accounts, one can say that he is not keen on political correctness and prefers to share his opinion about anything under the sun. But in spite of these, he has been proving himself to be a very effective crypto-trader. The D Man has had a significant history, and given that there are times he has broken the news much before the major crypto news outlets, there have been times when he was questioned for insider news. Also, the D Man is an author who has written an Amazon crypto bestseller by the title “Blockchain Decrypted for 2018 – How to Profit with Cryptocurrencies, Bitcoin, Coins, and Altcoins this Year”. The Blockchain Whispers also has a top fundamental analyst among them, going by the name Mr. Y providing insights about the industry. In fact, the analyst is said to have broken news about the listing of ZRX, Ethereum for 0x platform on Coinbase etc., even before it was made public. Some of the other significant predictions on Blockchain Whispers includes ZIL, he signaled will be listed on Binance to do 3X, which went on to do 3.5X; ONT went ahead to do 8.5X after the signal on the channel. Since THETA’s mention in the bestselling book, it has gained over 300% in value. Similarly, the channel had put its weight behind another altcoin, Pundi X encouraging the community to buy and hold until the value appreciated by 2000% before issuing the sell signal. Pundi did reach 20x for Blockchain Whispers followers, and the two days after D Man issued a sell signal, Pundi X started plummeting, never to return to old prices. In other words, they profited at the peak. If you are just a casual investor, there is a good chance that you have no idea where Bitcoin is heading. And this is where Blockchain Whispers comes into the picture. The channel, with a team of top crypto traders working on specific sets of puzzles, filter out all the noise to determine where the market is headed. 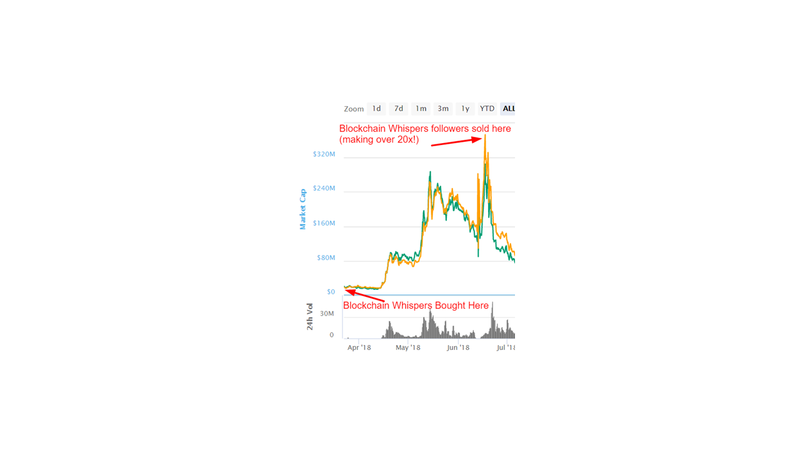 Blockchain Whispers has already gained a reputation among the community as one of the most reliable bitcoin signals and market insights provider. According to the channel, the members who joined the channel by December 2017 and followed all the signals didn’t lose more than 25% during the bear market season. By educating its members about the cryptocurrency market, Blockchain Whispers is empowering the masses to make profits and cut losses in the bear market by successfully shorting Bitcoin. The Telegram channel members also got their hands on a copy of the Blockchain Decrypted for 2018, which was selling on Amazon at $3. Since then, Blockchain Whispers has gained a steady rise in the followers, and the fee for its premium membership has also been hiked. In the following days, Blockchain Whispers is launching the developed-in-secret D.A.R.T. platform, where the best bitcoin traders in the world will get to earn their stripes, unlock rich bitcoin rewards and only one will wear the belt of the champion – the most accurate crypto trader in the world. The concept has already gained acceptance by the followers, who are looking forward to taking part in it to beat the odds.